Santa Fe Saloon, Goldfield, Nevada. 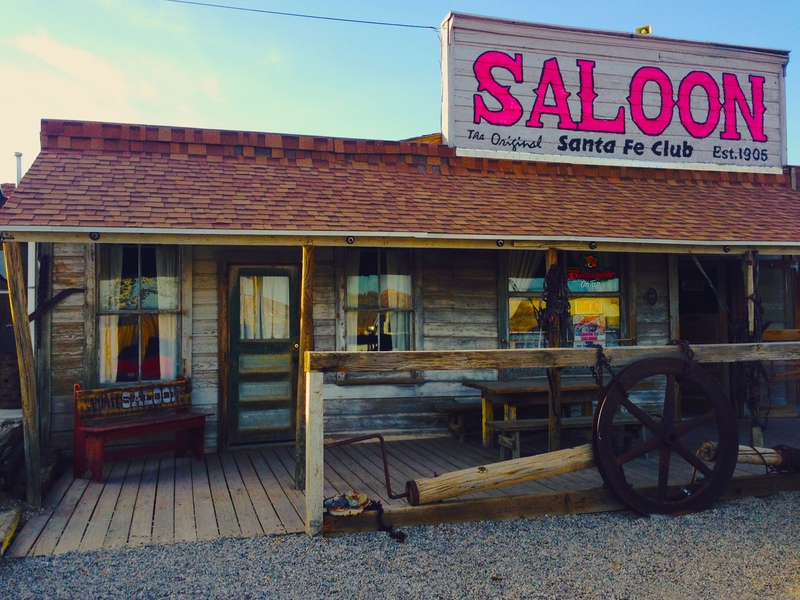 In a state with no shortage of old saloons, the Santa Fe’s claim to fame is that of oldest saloon in continuous operation. Just in case that isn’t enough to lure you in, a sign down the street advertises “Nevada’s Meanest Bartender.” Sold yet? You should be, the next closest place to grab a cold one is in Tonopah, Nevada 27 miles to the north or Beatty, Nevada, 67 miles to the south. The almost ghost town of Goldfield boasts this saloon as well an architecture that reflects its gold mining town past. Goldfield had its boom between 1905 and 1910 and for a brief time was the largest city in Nevada. 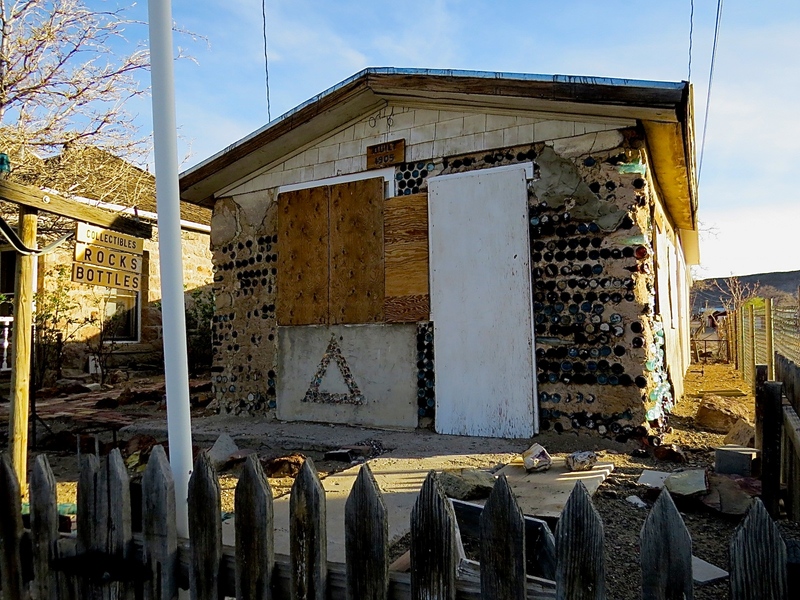 Evidence of the boom is still standing tall even though life in Goldfield for the 200 plus residents is life in a town “whose time done passed,” as they would say in the south where I’m from. 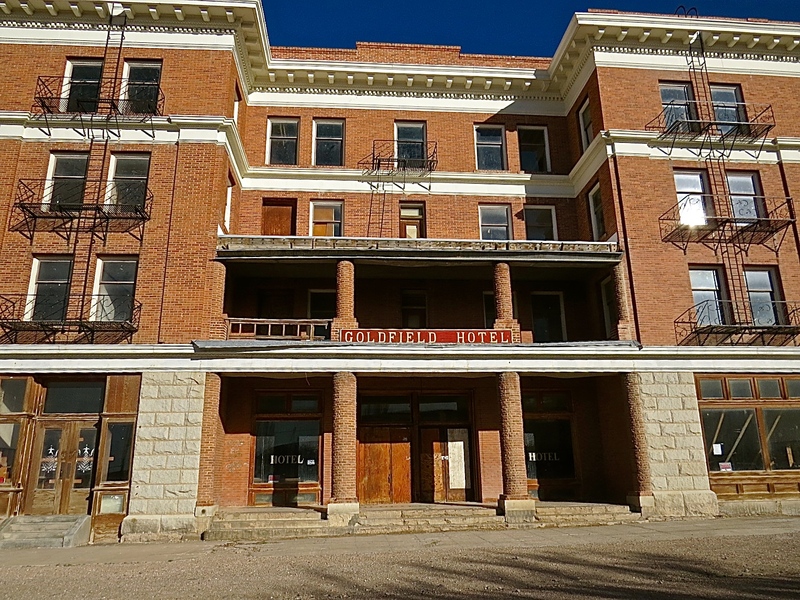 The reputedly haunted Goldfield Hotel is impressive in its brick grandeur, standing once-proud and sadly abandoned. Many people have made plans to restore the hotel over the years, but somehow that’s never panned out. This is a sad thing indeed because restoring the hotel could bring tourism and jobs much like it did at the Mizpah Hotel in Tonopah. The most recent round of promise came from a Nevada rancher who bought the hotel at auction for under $400,000 (why don’t I know any rich investors!?) and promised to restore it. When I was there in spring 2014 the hotel was vacant and begging for some love. Nevada hasn’t gotten the memo that no one smokes inside anymore so on a sunny clear day the Santa Fe Saloon is filled with locals and old-timers who are leisurely chit chatting and smoking over their regular drinks, clearly a scene that’s happened before, probably every day for as far back as anyone can remember. No one here is new except us, and despite the advertising, the bartender hands over our beers quite amicably. The bar feels like it’s been around since 1905, not because of its impressive historic artifacts or mementos but because it’s a beat-up and comfortable little dive. It’s not a precious time capsule but a good old watering hole of the if-it-ain’t-broke variety. There’s a life-size figure of Wyatt Earp and some slot machines for anyone who cares. No one does. The railroad yard of the Bullfrog and Goldfield railroad is across from the bar, an interesting place to explore. In the main drag there’s a functioning diner but no working gas station, a general store and a hardware store. A few stores with gold and gems, motorcycle wares and gifts are open for any would-be tourists. The town of Goldfield has clearly tried to rise from the ashes, tapping into its history, architecture and captivating geographical remoteness to build something that can survive today. It’s crossed the line from ghost to livingbut just barely. You might come here for the cold beer but make sure you stay awhile for the town. Enter your email address to follow WTRE and receive notifications of new posts by email.